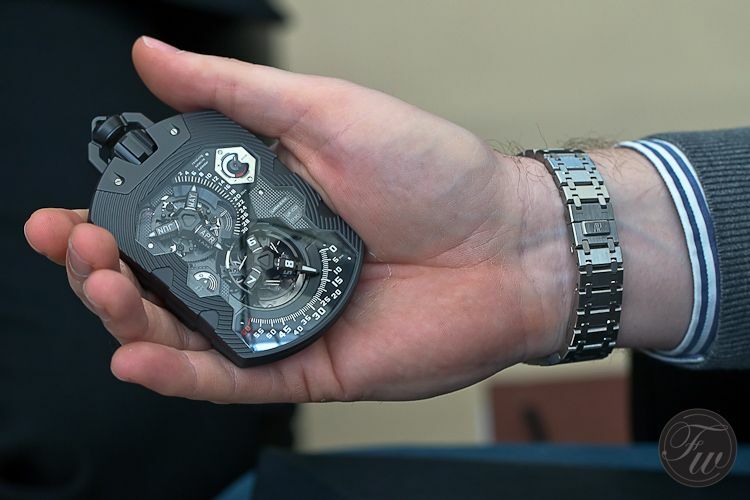 Urwerk is almost a normal watch manufacturer, because just like many other brands, they’ve included a pocket watch to their collection of impressive timepieces. 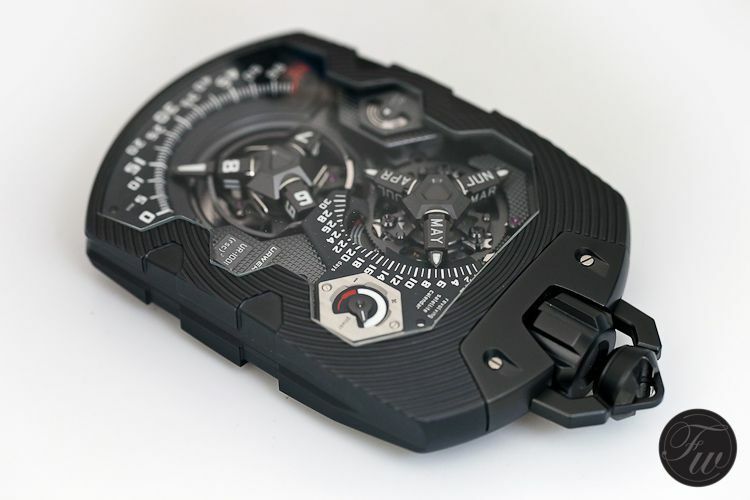 However, Urwerk wouldn’t be Urwerk if it wasn’t something really special. 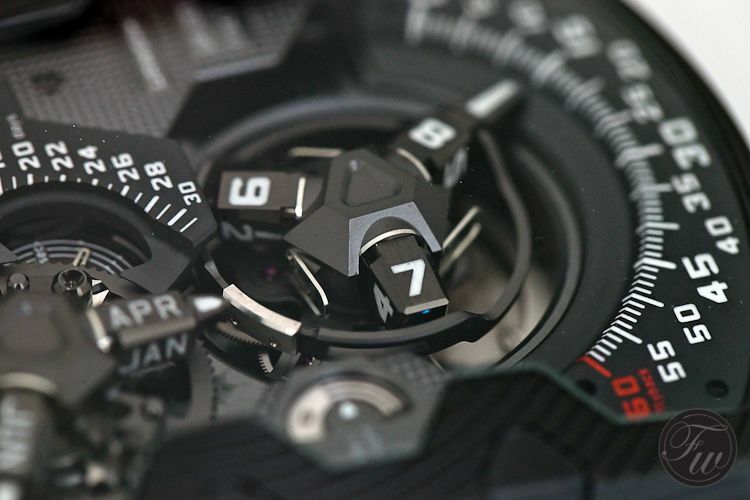 The UR-1001 Zeit Device is, in their own words, an über complication both measuring and quantifying our era, from a solitary second all the way to a monumental 1,000 years. A 1,000 years? Yes, you’ve read it correctly. 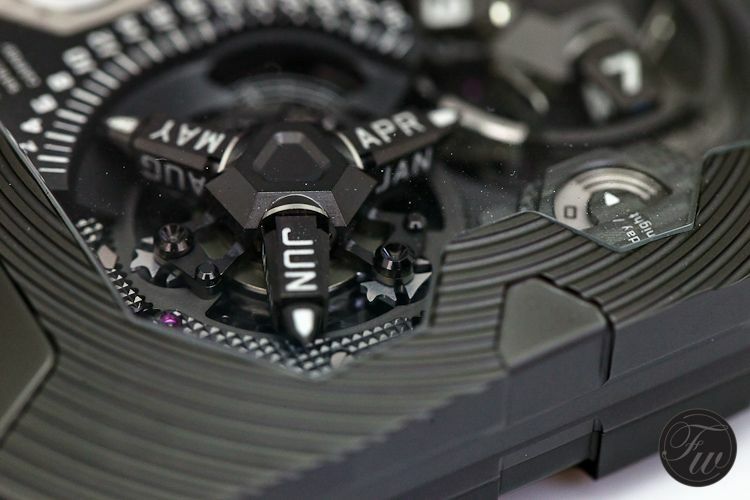 During our visit to BaselWorld 2012 we were able to see this beautiful UR-1001 Zeit Device in the flesh. The first thing you’ll notice when picking up this pocket watch is the weight and the size. 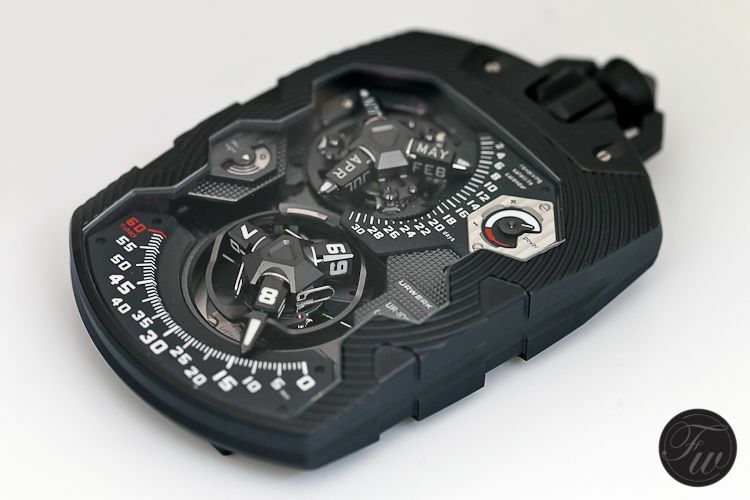 The dimensions of this Urwerk 1001 are a whopping 106mm x 62mm x 23mm. The watch is made out of AlTiN treated stainless steel and is restricted to 8 pieces only. AlTiN stands for Aluminium Titanium Nitride and is a perfect alloy for a timepiece as it has an increased resistance against oxidation and is harder than normal stainless steel. 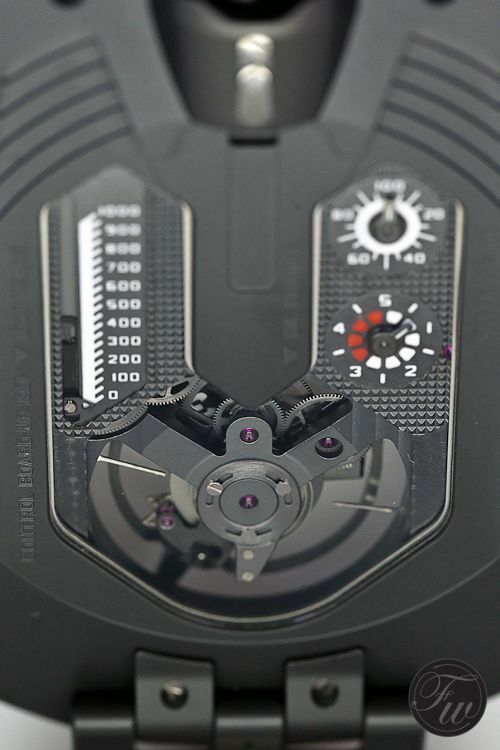 Just like the Urwerk wrist watches, e.g the UR110 and UR202S that we discussed last year (click here), this UR-1001 pocket watch works with the satellite system as well. The whole dial is a play field of orbiting satellites for hours and the day, retrograde hands, day/night and oil indicators and then we didn’t even turned around the watch (yet). 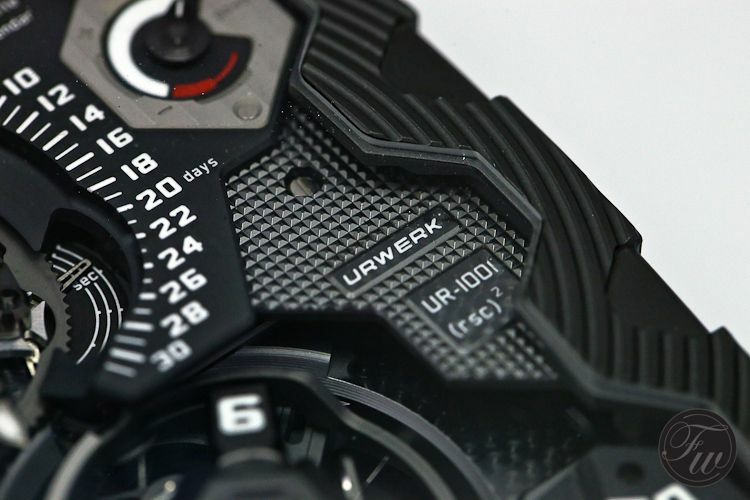 This 340,000.- CHF Urwerk UR-1001 houses 10 complications which are satellite hours and months, running seconds, indicators for minutes (retrograde), date, day/night, power reserve (39 hours), oil change (every 5 years), 100-year and 1000-year. The 100 and 1000-year indicators are – like the oil change indicator – something similar to the kilometer (or miles) counter in a car. It shows how long a watch have been running in total. Useful? It would be more than interesting to know how long a watch has been running from the start. It is something people (at least we would) wonder when buying a vintage watch for example. Where has it been, how long has it been in use, has it been serviced? The 100-year/1000-year indicator and the oil change indicator give at least some answers to those questions. The UR-1001 Zeit Device comes with a heavy chain, crafted from the same material as the watch and a desk stand that includes a winder to keep it running. 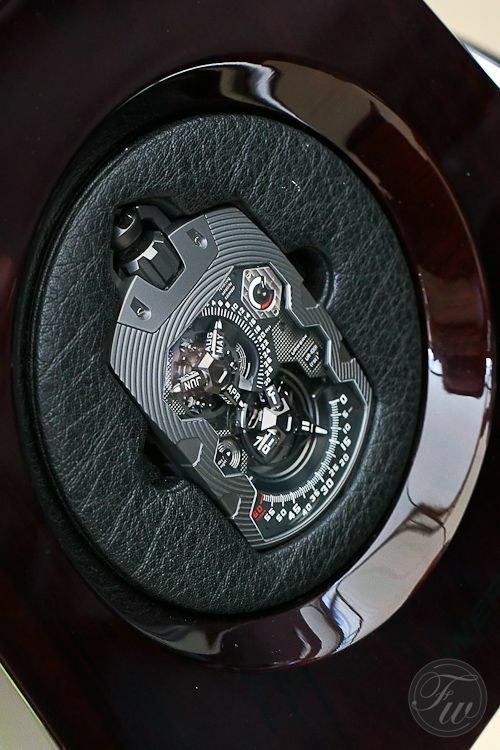 One can argue whether it would make sense to have an automatic movement (caliber UR-10.01) inside a pocket watch, but the winder takes care of that. 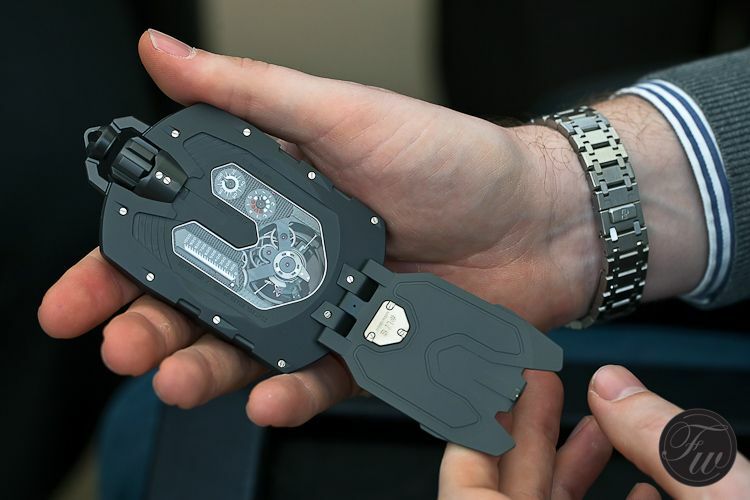 And just to demonstrate how large this watch is, we’ve included some photographs here of the Urwerk UR-1001 Zet Device ‘hands on’. Both the front and back are shown on the pictures below, notice the protective cover for the sapphire crystal on the back. 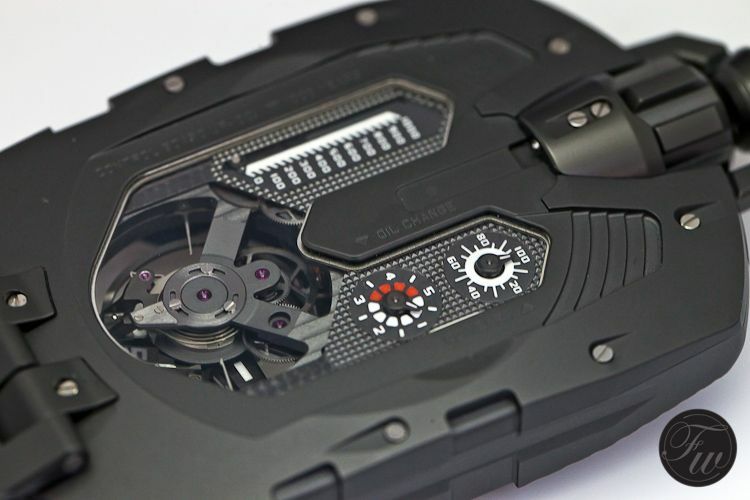 More information about the Urwerk UR-1001 can be found at the offical Urwerk website. 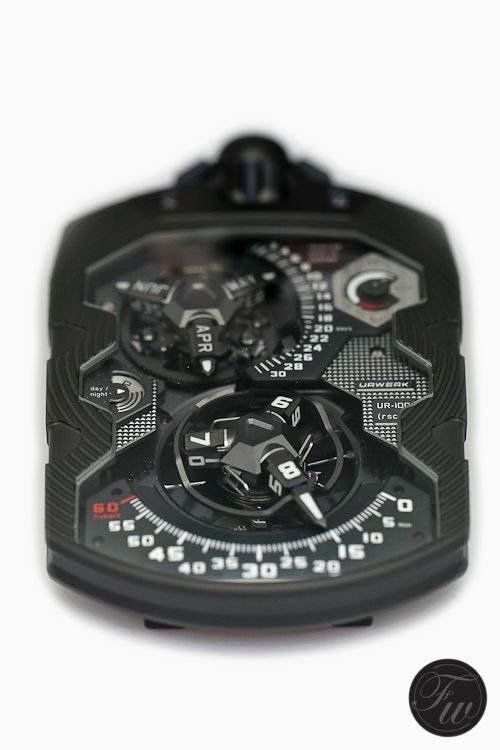 Make sure to visit their on-line photo gallery as well, as it has amazing pictures of this watch from every angle and a blow-up diagram of the entire watch as well.